Last week we were glad to welcome Joakim from Sweden, who wanted to discover something new for him. He is an experienced climber, but had never tasted the special kind of rock we have got here: conglomerate! Conglomerate is a clastic sedimentary rock that contains large rounded clasts. The space between the clasts is generally filled with smaller particles and/or a chemical cement that binds the rock together (definition by geology.com). There are many different kinds of conglomerate, more or less solid, with bigger or smaller clasts, with more pockets or more protruding stones. Here in Spain we have two more examples of good conglomerate crags, such as Margalef and Riglos. 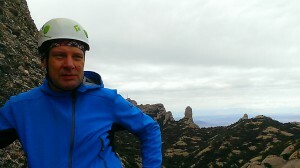 Nevertheless the conglomerate you climb on in Montserrat is quite different from these two other crags. 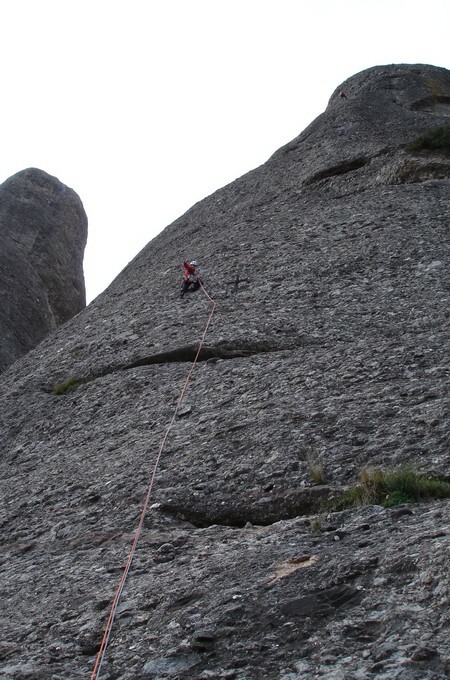 People say it is a “non commercial” climbing style, which means that if you are not used to it, it can be quite complicated to “read” the way up to an anchor and the difficult grade of most of the routes can appear very hard. Usually you climb on slab or vertical walls and you have to rely on very small slopers, crimps or pockets. Strong fingers and a good feet technique are required. 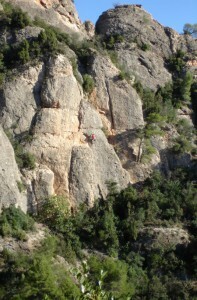 But, with just a little bit of experience, climbing in Montserrat can become very fun and give you great satisfaction. I promise! Climb In Spain arranged a two days climbing trip for Joakim with our local guide Lisi, the best specialist for climbing here in Montserrat. The first day was dedicated to sports climbing, the perfect way for the client to have a first contact to a new style of climbing and for the guide to test the level and skills of the client and decide what multi-pitch route is more suitable for him. The second day they headed to the classic area Gorros / Sant Benet for a pleasant experience on a multi-pitch route, which they also enjoyed a lot. Who of you understands Swedish can read the enthusiastic report of Joakim on his blog www.utsidan.se. Otherwise you can ask google translate for help. Thank you Joakim for visiting us! Looking forward to seeing you soon again! Posted in Climbing Trips, Crags.